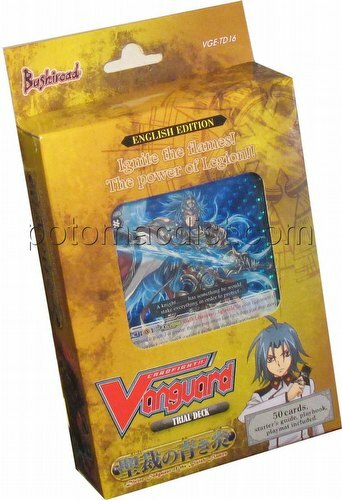 Dispense judgement with Olivier Gaillard's Divine Judgment of the Bluish Flames Trial Deck. Attain victory with the Gold Paladin Liberators' new and powerful Legion skill as they make their reappearance in the Legion Mate arc. This pre-constructed Trial Deck can be used out of the box and comes with exclusive Trial Deck only cards which will delight new and veteran players alike. Cards from the Divine Judgment of the Bluish Flames deck can also be used to strengthen existing Gold Paladin Liberator decks. Each deck contains 50 pre-set cards, a starter's guide, a playbook, and a playmat. There are 17 different cards in the deck (all trial deck exclusives, including 3 holo cards).